Worldly Muslimah: Is the Violence and Destruction in Gaza a Deliberate Israeli Policy? Is the Violence and Destruction in Gaza a Deliberate Israeli Policy? Is the Deadly Violence and Destruction in Gaza a Deliberate Israeli Military Policy? 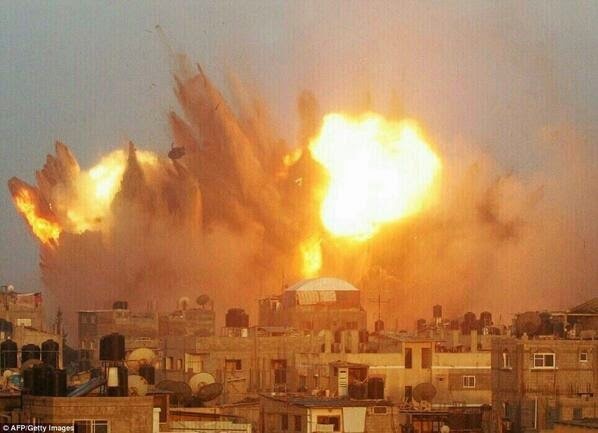 Israel's Operation Protective Edge military campaign against Gaza is now entering its seventh day. The death toll in Gaza is rapidly rising (reaching 183 as of July 14, 2014), and it has now surpassed the death toll in the last major Israeli military campaign in Gaza, i.e., Israel's Operation Pillar of Defense in 2012, which saw 171 Palestinians killed. The Israeli government has repeatedly stated that it is prepared to continue the aerial bombardment of Gaza despite the rising civilian casualties (the UN has reported that 77% of the Palestinians killed in the bombardment are civilians and two-thirds of the injured are women and children). It has also stationed thousands of its troops on the border with Gaza, with warnings that a land invasion is imminent. And on July 13, 2014, it was reported that the Israeli military had made its first ground incursion into Gaza, exchanging fire with Hamas soldiers, with an intent to disable a Hamas rocket site. This came a day after a particularly bloody aerial bombardment campaign in which at least 53 Palestinians were killed in their homes. Soon after this land incursion, it was reported that the Israeli military dropped leaflets in 3 neighborhoods of a northern Gaza area called Beit Lahiya, telling its residents to leave their homes before an impending attack. There are 70,000 Palestinians living in the Beit Lahiya area. Although, Hamas dismissed the Israeli warnings as "psychological warfare", the UN reported that at least 4000 Palestinians from Beit Lahiya have fled to Gaza city, holing up in UN-run schools; up to 17,000 Palestinians in all from northern Gaza have sought refuge in various UN facilities. The UN also reports that the Israeli military has made phone calls to households in various Gaza neighborhoods, playing recorded messages, warning its residents to evacuate their homes - while people have not taken heed thus far, the UN reports that should things worsen in coming days, 300,000 Palestinians could be displaced. Even if the mainstream media and certain world leaders attempt to sanitize (or even rationalize) the brutality of the aerial attacks on the Palestinians, and the consequent catastrophic destruction of people's living spaces and essential infrastructure in Gaza, the devastating human toll of Israel's military campaign on the civilians in Gaza is evident via the social media, where raw images are published and shared. Israel's standard refrain of self-defense, which it has used repeatedly in previous military campaigns against Palestinians, i.e., the air strikes are meant to disable Hamas' ability to send rockets into Israel, do not easily resonate with as many people, as it may have done in the past. By the Israeli military's own account, its Iron Dome missile shield is successfully intercepting the Hamas rockets. So far, there has been no reports of Israeli fatalities or serious injuries from the Hamas rocket fire compared to the large numbers of fatalities and injured civilians in Gaza that has been inflicted by the Israeli military. Furthermore, despite the deadly air strikes that Israel claims is targeting Hamas rocket installations "hidden" in civilian residences/mosques/hospitals/schools, Israel has not reported an abatement of Hamas rockets fired into their country. This then lends credence to the growing criticism that Israel is using disproportionate force. In Israel's two other recent major military campaigns against the Palestinians, one can argue that there is an observable pattern of Israeli military engagement with the Palestinians - an engagement that inflicts as much human suffering and deadly carnage, and infrastructure destruction to Palestinians so as to demonstrate Israeli military dominance and thus gain a period of peace through deterrence. This engagement policy was apparently developed out of Israel's failures during the 2006 war with South Lebanon, which led to the Dahiyah Doctrine. In 2008, one top Israeli military officer is quoted saying with regards to the Dahiyah Doctrine: "We will wield disproportionate power against every village from which shots are fired on Israel, and cause immense damage and destruction. From our perspective, these are military bases," he said. "This isn't a suggestion. This is a plan that has already been authorized." Another top Israeli military officer states: "The answer to rocket and missile threats from Syria, Lebanon and the Gaza Strip is a disproportionate strike at the heart of the enemy's weak spot, in which efforts to hurt launch capability are secondary. As soon as the conflict breaks out, the IDF will have to operate in a rapid, determined, powerful and disproportionate way against the enemy's actions. This strike has to be carried out as quickly as possible, through prioritizing strikes at its assets, rather than chasing after launch sites. Such a response is likely to be remembered by decision makers in Syria and Lebanon for many years, thus deepening deterrence." Some months after the above comments by the Israeli generals, the Israel's Operation Cast Lead began with devastating consequences, amid revelations that even chemical warfare was used by Israeli military against the civilian population in Gaza. Operation Cast Lead (2008): Palestinians killed - 1,391. Israelis killed - 13. Operation Pillar of Defense (2012): Palestinians killed - 171. Israelis killed - 6. Operation Protective Edge (2014): Palestinians killed so far (July 14, 2014) - 183. Israelis killed - 0. By one journalist's account, Hamas rocket firings, which averaged 240 per month in 2007 had dropped to five per month in 2013, which was at a "tolerable" level, with no Israeli fatalities, barring the six during exchanges in Operation Pillar of Defense in 2012. If there was relative peace throughout these last few years, why then have the situation escalated drastically? Israel pinned the blame on two Palestinian men that they claimed were Hamas members, an assertion that was denied by the men's family members and friends, as well as Hamas itself. After a Palestinian boy was kidnapped and burned alive in a revenge attack, things further deteriorated. And still, Hamas wanted to avoid conflict. Its political head, Khaled Meshal even went so far as to ask Turkey to intervene in the crisis with Israel and to convey a message that Hamas was interested in calming things down. When Israel killed a Hamas member on June 29 in an air strike, and the Hamas rockets started again (the first since the 2012 cease-fire), which allowed Israel to begin its air strikes with impunity. It has been suggested that Hamas had begun to build up an arsenal of weapons while the Morsi administration was governing in Egypt, allegedly with the latter's help. While it may be difficult for Hamas to do so now with the Sisi administration in Egypt, the perception that Hamas was re-building military capability might have been enough of a concern to Israel. For instance, in March 2014, the Israeli navy claimed to have intercepted a ship headed to Gaza - on board were 40 rockets with 100 mile range. In this current engagement, Hamas has managed to send rockets to Dimona (location of Israel's nuclear reactors) which is located nearly 65 kilometers from Gaza. And Israeli military spokesman Peter Lerner claimed that a Hamas rocket that struck the town of Hadera, more than 70 miles from Gaza was, similar to those found on the ship stopped by Israel in march. Lerner was quoted as saying: “We said back then that this was a game-changer." If Israel indeed took advantage of the situation surrounding the three missing (then murdered) young Israeli men, then they may have done so to restore its perceived notion of a power balance. And it is doing so by using its tried and tested Dahiyah Doctrine to display disproportionate power to inflict as much violence and destruction as necessary. So when Khaled Meshaal of Hamas says that the war was "forced upon us", there would appear to be some truth to it. And as usual, it is the people of Gaza that suffers.